The Old Foodie: The Inevitable Pudding. I am keeping it simple today, my friends – it is a busy time of year, after all. I am going to give you a couple of variations on the seemingly never-ending theme of Christmas Pudding. This dish is but a variety of the above [a baked apple pudding]; the writer thinks, however, that it may be not unacceptable to those of our readers who are forbidden to eat pastry in any form. It may be simplified or enriched according to taste, but the present recipe will be found very good. Chop separately, and mix as for mincemeat, four ounces of stoned raisins and four of apples, and two of beef kidney suet; add three of currants, three of pounded sugar, one and a half of crusted ratafias, two of candied citron or orange-rind,-half a glass of brandy, half a glass of sherry, or any other good white wine, the juice of half a large lemon, and the grated rind of more than the half, a grain or two of salt, some grated nutmeg, and a small portion of pounded mace or of cloves. Put these ingredients smoothly into a small buttered tart-dish, and lay over them four ounces of fine, lightly-grated, bread crumbs, thoroughly mixed with three of pounded sugar, and the slightest pinch of salt. Should the pudding prove too sweet, less sugar must be added to the mince, as the crust will not be firm and crisp without a certain proportion of it. The top may be brushed with clarified butter before the sugar is sifted on. The directions given for that of the apple-pudding apply equally to this, and need not be repeated. Half an hour in a moderate oven will quite suffice to bake it, as it is small. Observe.—The authoress has had excellent puddings of this kind made with summer fruit; those of cherries, of black currants, and of damsons were particularly good. When large plums are used for them they should be split, and a few of the kernels laid amongst them. 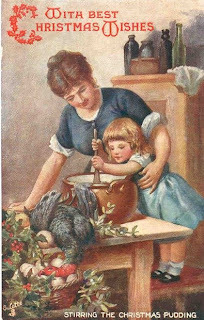 A pound and a quarter of flour, fourteen ounces of suet, a pound and a quarter of stoned raisins, four ounces of currants, five of sugar, a quarter-pound of potatoes smoothly mashed, half a nutmeg, a quarter-teaspoonful of ginger, the same of salt, and of cloves in powder; mix these ingredients thoroughly, add four well-beaten eggs with a quarter-pint of milk, tie the pudding in a well-floured cloth, and boil it for four hours. Flour, one pound and a quarter; suet, 14 ounces; raisins stoned, 20 ounces; currants, 4 ounces; sugar, 5 ounces, potatoes, quarter of a pound; half a nutmeg; ginger, salt, cloves, quarter of a teaspoonful each; eggs, 4; milk, half a pint :— 4 hours.